subungual hematoma: (sub-un-gw l he¯-ma-to¯-m ) n. a collection of blood underneath a toenail or fingernail. The word hematoma means “pocket of blood.” The term subungual means “under the nail.” Combined, the phrase refers to a pocket of blood trapped under a fingernail or toenail. Subungual hematomas often result from a traumatic injury such as slamming a finger in a door. A laceration of the nail bed causes bleeding into the constricted area underneath the hard nail plate. 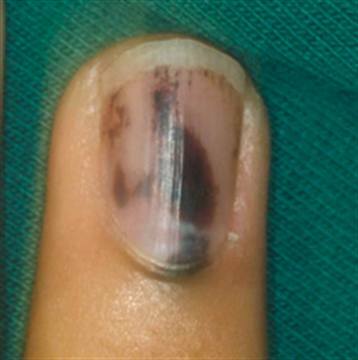 The nail develops a black discoloration above the laceration. The symptoms of a subungual hematoma are easy to identify. They often occur after painful trauma and they will be visible under the nail. Subungual hematomas look like a bruise under the nail, and can vary from a very small dot to the entire nail turning black. In these more severe cases, the nail often falls off. Many times pain accompanies a subungual hematoma because of pressure that’s built up under the nail. “Once blood begins to collect under the nail and it can’t drain out, the pressure builds and the pain can become severe,” explains Dr. Darren Weinheimer, a podiatrist in Binghamton, N.Y.
“There can be many causes of subungual hematomas,” says Dr. Weinheimer. Sometimes the cause is microtrauma. This is most often seen in the toenails of distance runners. When the nail hits the end of the shoe during extensive walking or running, it is often slowly affected. Sometimes the cause isn’t extensive exercise, but rather ill-fitting shoes. “Usually in these cases not enough blood develops under the nail for pain to develop,” says Dr. Weinheimer. “Usually there is only discoloration, but microtrauma can develop to the point where the nails become very loose. They may eventually fall off on their own,” he explains. A second cause of subungual hematomas is trauma, usually from a heavy object landing on the fingernail or toenail. Common causes are a hammer, a heavy jar, or even a car door being slammed on a finger. “The skin under the nail is very thin,” says Dr. Weinheimer, “and it bleeds very easily.” If the injury is severe, and a significant amount of blood collects under the nail and it can’t get out, pressure builds and a person can feel severe pain. If there is no pain associated with the subungual hematoma no treatment is necessary. A person can leave the injured area alone and the darkened spot will grow out eventually. If, however, a person feels continued and increased pressure and acute pain, “icing the area is a good idea as it helps shunt the blood supply and helps with swelling and pain,” advises Dr. Weinheimer. If a pain duller is necessary, choose Tylenol. “Taking Tylenol for pain is a better idea than ibuprofen or Advil, because Tylenol will not thin the blood like those other medications,” says Dr. Weinheimer. If the pain continues after ice and Tylenol, it’s time to call a doctor. By the time a client sits at your desk, she will have walked through all the steps of the injury: the trauma, the pain, and the treatment, either at home or in the doctor’s office. However, it’s very likely you’ll see clients with the now-dried blood still under the nail. It will be unsightly, of course, and look like a black spot under the nail. A tech has a number of choices of how to respond. Techs should be concerned if a client comes in from one fill to the next and the affected, darkened area has not grown out. “The discoloration could actually be a malignant melanoma and would need to be excised as soon as possible. The client should see a physician immediately,” says Dr. Weinheimer. If the affected area is small and the client uses a nail color that will hide the discoloration, it may be the best choice to simply leave the area alone and perform a standard nail service. “If there is just discoloration of the nail and it is growing out fine, then applying polish or artificial nails should be okay,” says Ft. Worth, Texas-based podiatrist Dennis Arnold, who is founder of the International Pedicure Association. Educate the client, letting her know the area will grow out at the normal rate. There is no danger in leaving it alone. “It should be okay for acrylic to the applied over these areas as long as the nail bed is dry and healthy,” says Dr. Weinheimer. If the underlying skin has not healed yet and the area is raw, techs should wait before they apply any product. Michelle Pratt is a freelance writer and licensed nail tech based in Johnson City, N.Y.